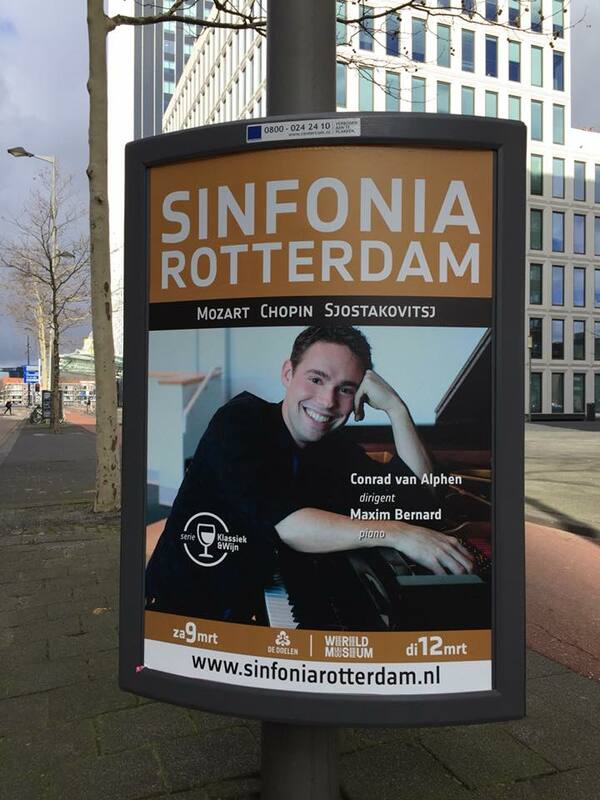 In early March, Quebec City’s Maxim Bernard had a ‘wow’ moment when he arrived in Rotterdam for a four-concert tour of The Netherlands with Sinfonia Rotterdam. He found a larger-than-life photo of himself on concert posters in large advertising frames on the streets of Rotterdam. The Hague, and Amsterdam (Concertgebouw), the other cities on the tour, probably also had him on display. Bernard is literally the poster child for any youngster who thinks one has to start the arduous path to concert musician at an early age. He discovered his passion for piano at the age of 13, and made such tremendous strides that he was invited to play Beethoven’s Fourth Piano Concerto with the Edmonton Symphony Orchestra when he was 18. He has lost none of this passion, and the radiance of his playing is incredible. A prize winner at many competitions, the CBC Young Artists Competition, the Indianapolis Matinee Musicale Competition, and the Indiana University Jacobs School of Music Concerto Competition among them, his career was launched after he won the prestigious International Stepping Stone of the Canadian Music Competition. Both a frequent recitalist (first introduced to Acadia in February, 2016, on a Debut Atlantic tour of the Maritimes) and orchestral soloist (beginning with Edmonton), Maxim Bernard has been heard with Montréal’s Orchestre Métropolitain under conductor Yannick Nézet-Séguin (now director of the Metropolitan Opera Orchestra in New York), the Orchestre Symphonique de Québec, the Orchestre Philharmonique du Nouveau Monde, the Peterborough Symphony Orchestra, the Bloomington Symphony Orchestra, the Ottawa Symphony, and Les Violons du Roy. In Europe, he has given solo recitals in Cologne, Bonn, Paris, in Vienna at the Konzerthaus, and in Brussels at the Palais des Beaux-Arts. In July of this year, he will make his debut in London at Wigmore Hall – the pinnacle for any artist – a recital hall built in 1901 by the German piano firm Bechstein next to its showrooms on Wigmore Street. Here in Wolfville, we may not have the Renaissance splendour of Wigmore Hall and its time-honoured reputation for crystalline acoustics, or, for an artist, of having arrived. In London, Maxim will join the likes of past and present greats Ferruccio Busoni, Nellie Melba, Artur Schnabel, Enrico Caruso, Andras Schiff, Stephen Isserlis, Benjamin Britten and Peter Pears – the list is endless after over a century of concerts. But the Garden Room on April 14 will have the main ingredient in common: the very same all-Chopin program Bernard will present at Wigmore Hall: Chopin in all his states.